Hi everyone! Today is the fourth day of the My Favorite Things August release countdown. This release is packed with amazing new products! Isn’t it? The new products will officially be available on the MFT online store on August 4th at 10pm EST (= Europe: August 5th at 4:00 CET). Love those Birds of Paradise in this new release! You have made an amazing card with a fantastic background for the bird so that he can shine and be the final point!! I love your Coloring - I say it every time - You are such a Pro!!! Love the Birds of Paradise stamp set. Your card is AWESOME. I really like the bubbles in the background and the colorful bird. This sentiment is so neat. This is such a cute set and I love your card. The "bubbles" in the background really set it off. Very cute card! Love the circles and sentiment! Beautiful job coloring the bird Francine. Your card is lovely. Thanks for sharing. Very cute card and sentiment! So pretty! I love the bubbles you created around the image. Thanks for sharing! Cute card. I love the background that you made. 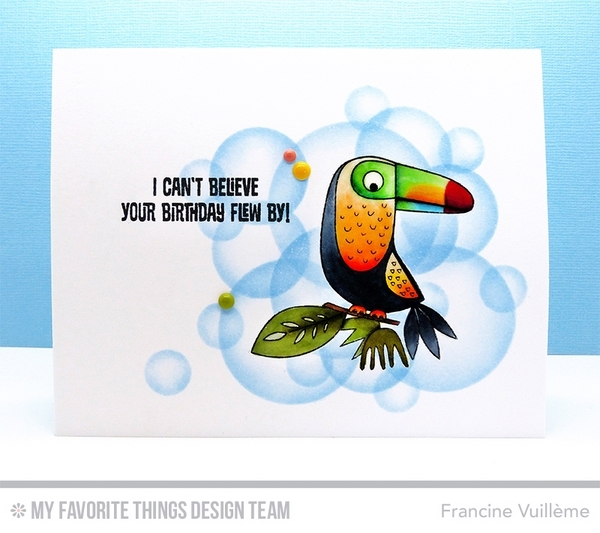 Very lovely card--these tropical birds are wonderful! the bubbles looks so real! I love your card!